Show your movie collection to the community! How long have you been using All My Movies? Tell us how many movies you've got, which genres prevail in your collection, which templates and view mode you prefer and how often you use All My Movies. Which features are your favourite ones? It would also be great if you could make a screenshot and show it here. In other words, be creative! At present I have 2688 movies in my collection. I have been using AMM since version 5.9. Before that I used MovieCollectorz and was very happy with that, until they closed for IMdB access and started using their own database. I use a slightly modified version of the 'Indian' template. I prefer to use the thumbnail view and sort my movies on movie number, so that I always have the latest added movies first on the list. I only use AMM as a collection database, since all my movies are on DVD's. I have all genres of movies, but my favorites at the moment are Asian/French horror and sci-fi. 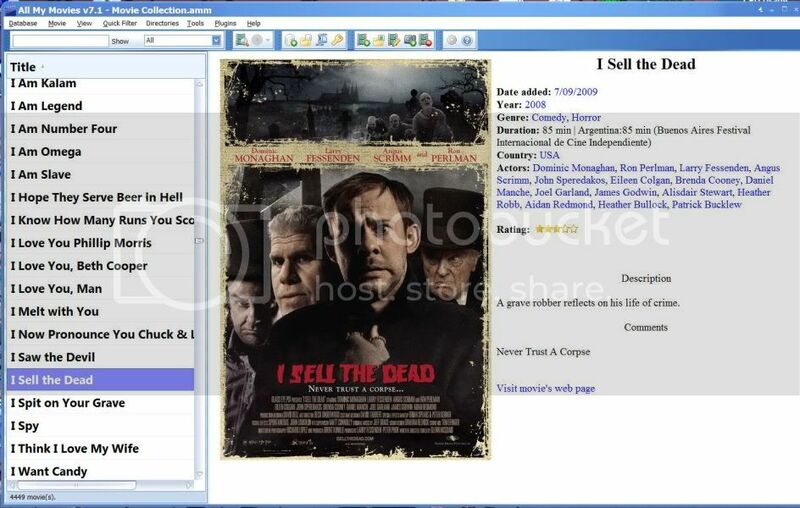 The best about AMM is that it collects info from IMdB and that it is very simple to use and easy to customize. Thanks a million for your replies and suggestions! Your collections are really impressive Around 3000 movies! As for the Android app, we're working at it. Yeah, we know that it is going to be a big step forward and something most of our users are looking forward to! We'll try to do it ASAP. Thanks again for sharing! Really appreciated! Been using AMM since 2009, and I believe it was version 5.x. I currently use a slightly modified version of the golden moviecard. I prefer using list view to have the titles sorted alphabetically. I have three databases which include the following totals. Movies: 2,604; TV Series: 474, and Documentaries: 146. The prevailing genres would be Science Fiction and Horror. The rest is a mix of different things. I use AMM all the time. Without it, I would never know where my media is, what was on it, or if I had already seen the show or not. As far as features go, I like the ability to mark TV episodes as watched, without marking the entire season as such. This way I can keep track of it as I go. Importing large covers is nice since my eyes are not what they used to be. I also like the ability to use different views. There really isn't much I don't like about AMM. So keep up the good work, and thanks for a great product! Here is a screen shot of my collection. Thank you ever so much for your interest to the topic and sharing your collection! It's really large - you must be collecting movies for years! Thank you for using AMM for a long time and for praise words about AMM! We'll try to make the program better! Like how to export to html (or any other format, for that matter). I guess it's just as well that I cannot export because the available templates leave a lot to be desired. The program is easy to use and does a great job as a database on the computer. It could use some new templates for all areas, though. Here's a screenshot of my "work-in-progress"
As for templates, yeah, we're working at the new ones now. Thanks a lot for sharing . 4449 movies - that's a lot! That's amazing - you've been a devoted AMM user for 5 years! Thank you so much for loyalty and your help in program development - we hope AMM meets your expectations. We're doing our best to get better day by day. I like the simple and elegant design look that contains all the options in an orderly fashion. So thank you for that, and I look forward to the new available features. Very nice collection uoriel. I see that we have the same taste. Thank you very much for sharing and for being one of the loyal customers of our company! And we're always grateful for your suggestions to make the program better! I tried to delete this post as the link did not work instead I created a new one so have edited this to explain. Last edited by liz grant on Sat Oct 13, 2012 10:17 am, edited 1 time in total. I also LOVE the program and have used it for about 18 months. Version 5 I think. Since having this app I can now keep track of my movie database. I have quite a few databases some with many of the same files as I provide films for family and friends. I have a completely separate DB for tv series and as I am constantly updating and adding films and tv series I have a db for every letter of the alphabet. Which I combine occasionally into the master. Thank you for all the various updates you have provided and also the advice on how to. I do not like the actors field until I combine the movies and you recently helped me to hide this field for which I am truly grateful.